Agile Attaché or Coach’s Companion or Super Agile Satchel – Agile Grit. Keep Moving Forward. 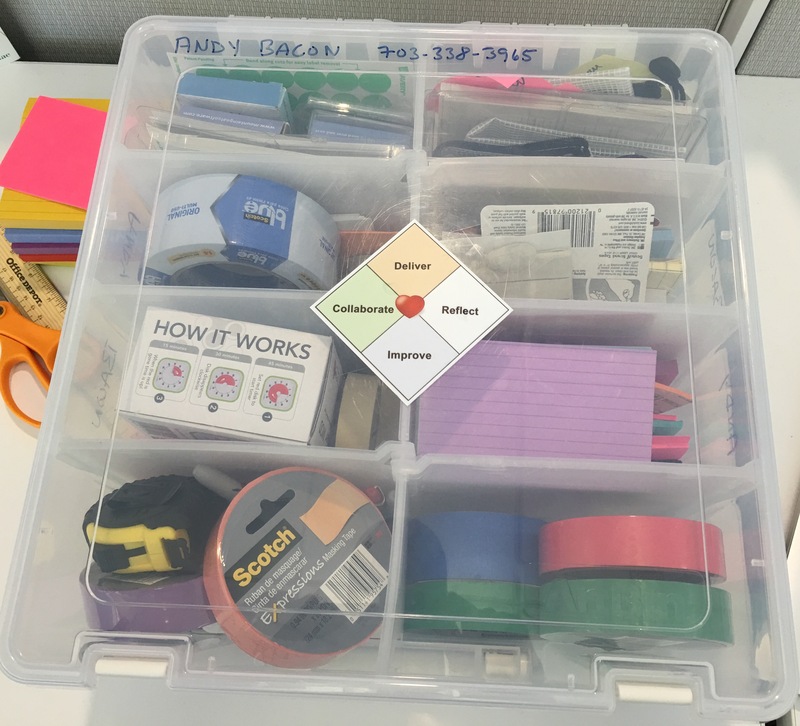 I used to carry my facilitation tools (markers, stickies, etc.) around with me in a plastic shopping bag. While at my desk, a pile like this one usually began to form and occasionally toppled over. Typically, it was much more disheveled than the one in the picture, but you get the idea. Perhaps you can relate. Well, all that changed about 6 months ago. I was about to start a new job and I really wanted a better way to carry my facilitation kit because walking into a new company with a plastic bag didn’t scream professionalism. I had seen my coach colleagues tote around suitcases when they are training, but had never really seen something that one would carry around day to day. So I went on a mission to find the perfect carrying case for my tools of the trade. It took a few trips around the Container Store, but after about an hour of trying out different options, I found my solution…the Coaches Companion…or maybe it’s the Agile Attaché. I haven’t decided on a name yet…maybe you can help me name it! Anyway…what I found was the ArtBin Double Deep Super Satchel. And with a badass name like the Double Deep Super Satchel, how could I go wrong! Maybe the right name is S.A.S…the Super Agile Satchel? Once I got it home, I started to explore it’s potential by adding my stuff to it. What I immediately loved were the six dividers that come with it. You can arrange them any number of ways, but I ended up using them all to create eight equal sized compartments. The dividers go all the way to the top, so nothing falls out of the compartments. Pretty awesome. Here is a more recent picture of what’s inside. Notice the sweet Heart of Agile sticker. What do you think? Should I open up a store on Amazon and start to sell them 🙂 I figure there has to be at least 2 or 3 people that would like one! What do you think about the name? Agile Attaché, Coach’s Companion, Super Agile Satchel? Any of those resonate? If you have any ideas, please let me know. it should be easly transportable, in the form of a solid bag with different compartments. And you should add some easel pad to it. That’s awesome, found it on amazon in different colors too. I’d like to get this for all SM’s I work with, not very expensive either. So glad you like it! $17.50 on amazon…can’t beat it!